I had cause to think about that during a visit to Scotland this week, just a month before all residents of Scotland over the age of 16 get to answer the question: “Should Scotland be an independent country?” If more than 50% of those who vote say yes, the United Kingdom will be united no more. As the photo above indicates, the Indonesians didn’t have it quite so easy. The former Dutch colonisers, who fled the invading Japanese at the start of World War II, fully expected to waltz back in to re-occupy Indonesia after the Japanese surrender. It took four years of tortured negotiations and bloody resistance before the Netherlands conceded that Indonesians should be allowed to govern themselves. The Scots get to achieve nationhood just by showing up to the polls and declaring they want it. And yet almost none of the discussion I heard in Edinburgh was about national identity, about what it would mean to be Scottish. Everything seemed to be focused on the practical minutiae of a split; the currency Scotland might use in particular. The coverage in the London-based “British” press is even more focused around the belly-button of administrative details. It’s easy to make fun of Indonesia’s slapdash declaration of independence, with its “etc.” and its “as soon as possible”. But if nationalists had sat down and worked out all the administrative details of the highly improbable country now known as Indonesia before they declared independence, the Dutch would still be there. As I’ve observed before, Indonesia is still now working on its ‘etc.’ And yet on its 69th birthday, it is looking stronger than ever before. The 1950s were riven with dissent; there were active (and sometimes quite bloody) rebellions in West Java, West Sumatra, Aceh, Maluku and Sulawesi. 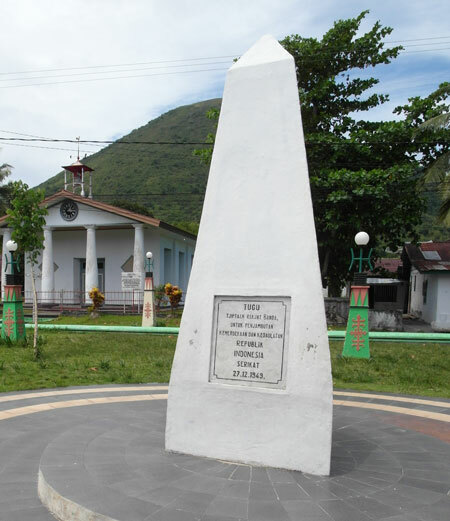 This was not least because in some versions of the history of independence, including the one immortalised on the monument in Banda Neira pictured here, islands outside of Java expected a great deal more autonomy than they actually got once Sukarno began consolidating his own centralising vision. The salient event of the 1960s was mass murder, which took different forms in different parts of the country but left nowhere untouched. The 1970s saw the unhappy “integration” of East Timor, whose people immediately started resisting Suharto’s forces. Papuans, cajoled into joining Indonesia just a few years earlier, began to make their displeasure known too. And the Quixotic Achenese-in-exile Hasan di Tiro spent a brief spell making trouble back in his homeland. Although low-grade rebellions grumbled on in East Timor and Papua through the 1980s, it was a relatively quiet time, mostly because the army had grown better at stamping on the first signs of independent thinking. Labour unions were progressively emasculated and the first signs of resurgent rebel activity in Aceh were comprehensively crushed. They surfaced again in the 1990s in part because the army, fed up that Suharto’s family had elbowed it away from the trough of ill-gotten gains, was less keen to defend the Old Man. The decade ended in chaos, with the economy in free-fall and Suharto on the skids. The start of the new millennium, when different groups were jostling for power in the post-Suharto landscape, was a dangerous time. The military, regional elites, radical Moslem groups and others circled one another in an attempt to secure resources and there were many conflagrations. But over the last 15 years, the country has settled down. Indonesians have just rejected the offer of a return to the “good old days” of stability enforced with an iron fist. Since his defeat, Prabowo Subianto — the man that offered the iron fist — has dedicated himself with almost comical excess to reminding Indonesians just how right they were to look to the future rather than the past. The future is full of challenges, certainly. But if the new government can steer a course between the needs of the nation and the desires of the regions, Indonesia’s eighth decade will be its strongest and most peaceful yet. The potential citizens of an independent Scotland should keep in mind that nations don’t have to sweat all the details before they actually exist. The Scottish referendum is not about the pound, or Europe, or Trident. It is about whether Scotland should exist as an independent nation. If enough people share a conviction that it should, they can work out the rest as they go along. Aceh’s new leaders: Militantly religious? 2 Comments on "Indonesia Etc: lessons for Scotland"
What a joy and sometimes what a sorrow it has been to read your book. Laugh out loud moments interspersed with sudden insights and great sadness about the state of this wonderful country. Each year on Independence Day over the five years I have lived here, I have had to make a speech to my mainly Indonesian community. It’s ironic because I was born in the Netherlands, although I grew up in Australia. I usually reflect on the idea that Holland had only just been relieved of the yoke of Nazism and yet could not see that maybe Indonesia could feel the same. My father was involved in the Dutch resistance and ended up in a forced labour camp so it is especially poignant for me, living in the City of Heroes, to walk around and see what Indonesians had to suffer. They had no American, Polish or Canadian soldiers fighting for their freedom. I’ve just discovered your blog. I look forward to Q&A on Monday night where you are to be a guest. And maybe I will see you in Ubud. Thanks for a lovely week of reading about this place I am privileged to live in. Elizabeth — Femmy and I are thoroughly enjoying the tour de force and perspective of your new book. I’ve been urging it upon everyone I meet who shows the slightest interest in Indonesia, and especially our dynamic, socially-active local independent bookstore Village Books. I’d be delighted if we could get the bookstore, the Western Washington university, and the professionally-oriented journalism department that I helped found here to collaborate on getting you to Bellingham WA for campus and community talks on both your primary current concerns — Indonesia, and HIV. Let us know if your personal or professional itinerary should wander this direction.